I got some great log cabin blocks by mid April in a Kaffet Fasset Block exchange and now it is my turn to make blocks for some of the other ladies. 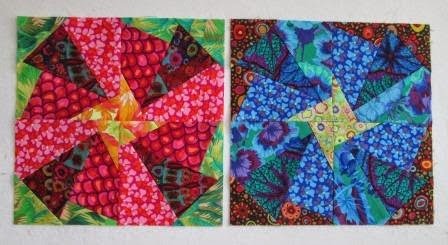 The top set of blocks are called Counter Spun and are paper pieced to 10". The pattern came from this site Quilters Cache. I was amazed to see how many different blocks and different sizes there are here. 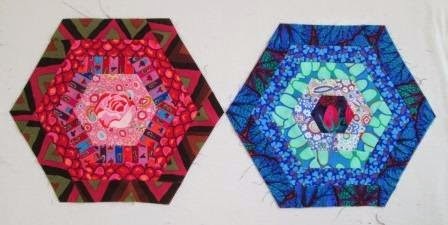 I made these blocks for the next lady she found the hexagon pattern on Freshly Pieced, and directed us to the site. Then she asked for just a few small changes, Like to leave the blocks as a hexagon and not make it a square. I love log cabins and have fallen in love with the block. Maybe I have to do a quilt for myself someday. Well soon the next lady will post her block pattern and I will have a month to complete and get them in the mail. Went to the Cache and looked at the finished offerings - I like yours better, Cathy. They're very pretty. Also like your Hexagons... I don't know if I could do one of those. Creative cutting. No confidence.